Formed in 1995 by guitarist Y following his arrival in Stockholm from his home town of Katrineholm, he wasted no time in putting together the band along with the bass player Markus Johansson and vocalist H.B. Anderson, both of whom had recently arrived in Stockholm themselves also intent on furthering their musical careers. In no time at all, songs were written, shows were being played, a deal with Swedish label GMR Music was in place and in 2002 the debut album ‘Beyond Reality’ was in stores. Produced by Jonas Östman (Yngwie Malmsteen, Glory) the reaction worldwide was incredibly positive! The band’s triumphant return to Sweden saw them hook up with drummer Tomas Lindgren, who had himself just returned from the States — in his case LA! — to begin writing songs for album number two. ’Neo Natural Freaks’ was again produced by Jonas Östman and mixed by Stefan Glaumann, famed for his work with teutonic terrors Rammstein and Stockholm’s own glam punk behemoths Backyard Babies. Fatal Smile release the first fruits of these labours in December -05/January -06 with the single and video for “Learn — Love — Hate”. The album ‘Neo Natural Freaks’ sees the light of day in January/February 2006. Forget what you think you know about hard rock in 2005. Whatever you think you know is redundant. 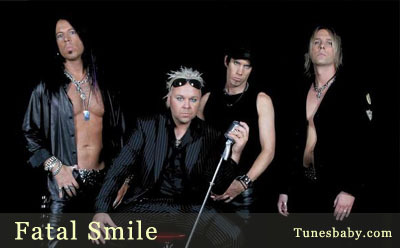 Fatal Smile have made it so. Influenced by the sounds they grew up with but not dictated to by them, theirs is a sound that takes rock in new directions whilst always having one eye on home. Comforting yet exciting, dangerous yet strangely familiar. Not afraid to bend the rules of the game should the need arise, one day all band’s will be made in this image….